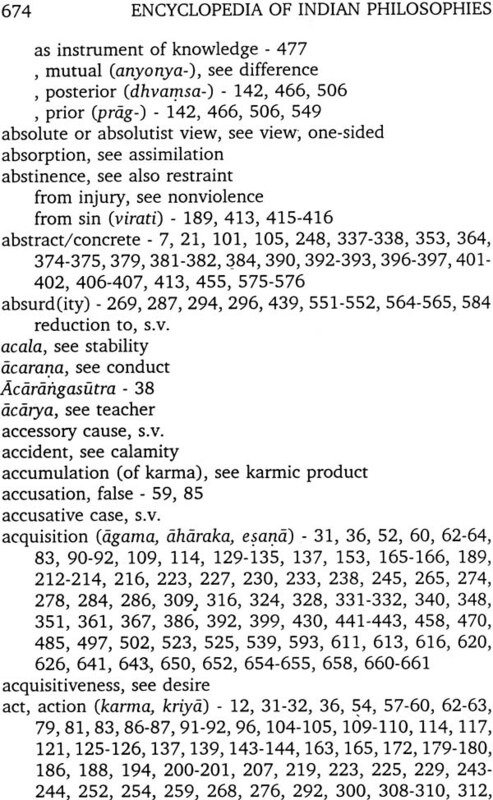 The philosophy of Jainism is the subject of a large body of literature, but a great deal of it consists of standard summary reviews that are not sufficiently accurate to bring out the uniqueness of Jain thought. The core thesis of Jain philosophy is that of anekantavada, often rendered as "many-sidedness" for example. 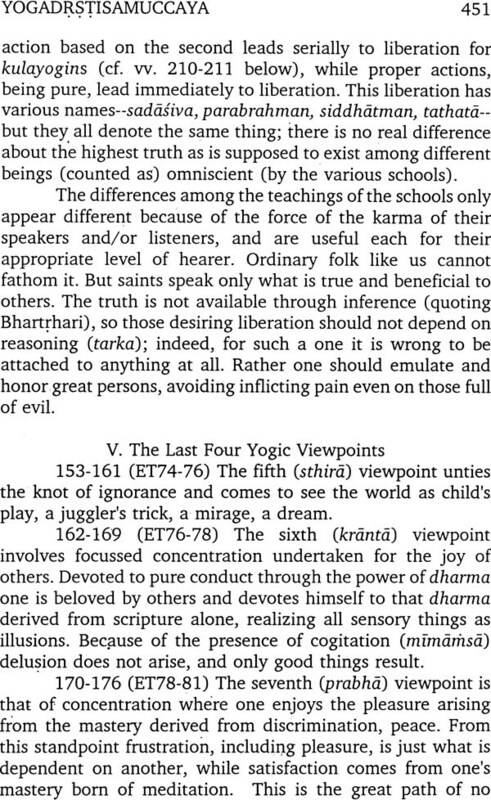 Such a rendering by itself fails to get to the unique contribution of the Jain positions, which is just that every serious account of the world contains elements of truth, but that any single linguistic expression must fail to comprehend all those partially true perspectives or viewpoints, not because those viewpoints are false, but because the complete truth is not consistently expressible in any natural language, since any such expression must necessarily involve contradictions. 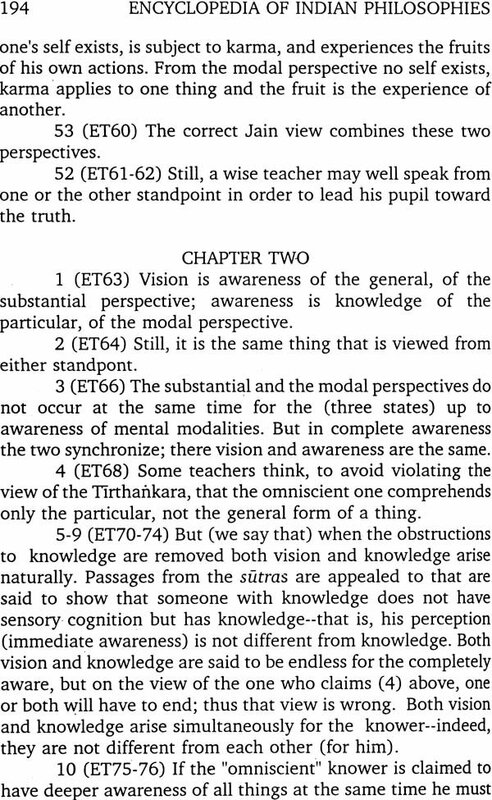 The Jain position leads to evident problems in assessing any of the philosophical thesis broached by a Jain-are we to take them as truth-claims, or as merely some among an indefinite incompatible ways of looking at the world? If the latter, how can the Jain saint have or gain knowledge-can he grasp collectively all the indefinite number of true theories? And if the former, what happens to the truths presumed to be contained in each of the incompatible alternative viewpoints? The works summarized in this Volume explore these questions and their possible answers. I wish to begin by offering my profound thanks to Dalsukh Malvania, who over thirty years ago agreed to take on the onerous task of editing this first Volume of the Encyclopedia to be concerned with Jain philosophy. Unfortunately he was unable to complete the task, and Jay Soni has agreed to assist by writing the Introduction and providing expert advice. Shortcomings of this Volume should not, however, be ascribed to either Malvania or Soni; they are entirely my own. Since it has recently been questioned, perhaps a word of explanation about the intended scope of coverage in Volumes of the Encyclopedia, which may go some way towards answering questions that may arise about the works chosen for summation in the present Volume. 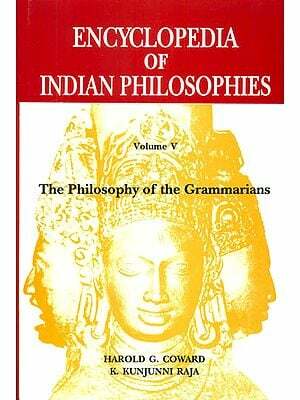 According to a policy that was announced in the very first edition of Volume One, the Bibliography is "intended to provide an account of works of Indian philosophical literature which are (1) of philosophical interest throughout; (2) theoretical rather than purely practical in their intended function, and (3) polemical or at least expository in a context where defence of one view among alternatives is appropriate." 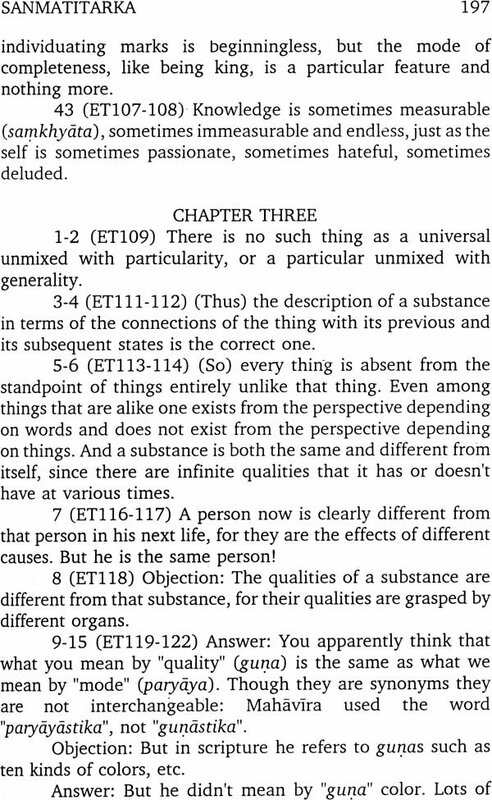 Readers of previous Volumes will appreciate that out of respect for those whose personal preference is for a given philosophical system I have refrained from using these strictures to preclude the appearance of favorite works which may not hew precisely to these three requirements. Some beloved works, for example, consist essentially of advice to the aspirant for liberation. To use the three requirements listed above to exclude such favored texts would have unduly offended those readers and made the Volume somewhat less useful to them. It seems thus wisest to exercise the policy stated above in a relaxed manner, enabling inclusion of borderline cases favored by the system's followers. One or two words recapitulating my policies on a couple of matters. Standardization of translations of technical terms, which we have followed in this and previous Volumes, may cause the style of exposition to appear cramped and otherwise difficult to read; even possibly misleading renditions may occur in a few cases. The problem comes about as a result of the tension between two aims I have tried to follow, one to provide an accurate (although not always standard) rendition of the term where it occurs, and the other to use the same translation of the Sanskrit term throughout if this is at all possible. I apologize for any problems that may have been caused by my intentions in this matter. In order to make the summaries less prolix I have followed a fairly strict policy in the present Volume (I have been working toward it in previous Volumes). The chosen English rendition of a technical Sanskrit term is given (in Sanskrit, not in Prakrit) at the first occurrence of that term. 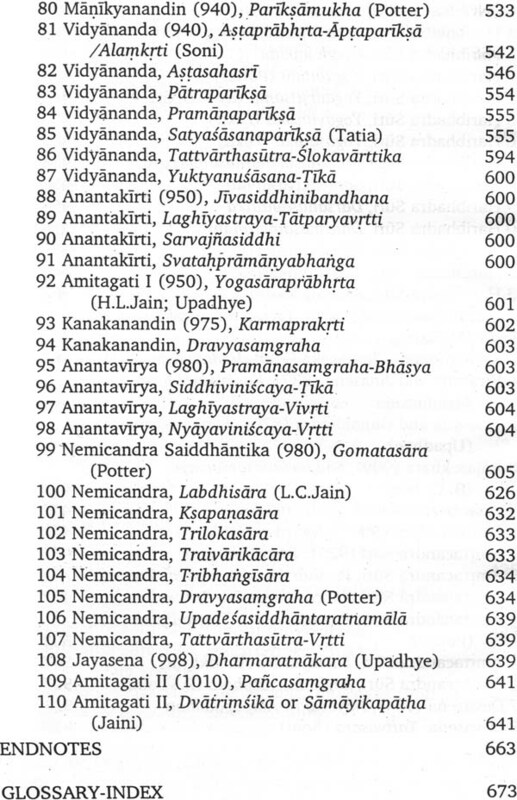 The Sanskrit term, and its chosen translation (or, in a limited number of cases, alternative translations) appear in the Glossary-Index, which should be used to remind the reader of the Sanskrit term, or range of terms, that is being rendered through the English word provided. My thanks, once again, to Christine Keyt for her generous help in all sorts of matters having to do with this computer age, and for her assistance in making it possible to keep the Bibliography up to date and available through the Internet (at https://faculty.washington.edu/kpotter). Readers wishing to keep up with the literature on their favourite philosopher, school or topic are invited to avail themselves of this information. What is Jainism? Jainism is a word derived from "Jaina" or "Jain", which in turn is derived from the Sanskrit word jina, literally meaning "conqueror". In the Jaina tradition a jina is a unique human being who, through severe ascetic discipline, has conquered, overcome or broken the bonds of the passions which bind one to worldly life and values, and who teaches the basic doctrine of nonviolence. A jaina or Jain is one who follows this and other teachings of a jina, and for the ascetics, being a Jain means one who strives to lead a lifestyle on the model of a jina. Since the life and teachings of a jina serve as a bridge or ford (tirtha) to cross over beyond the stream of worldly existences, a jina is also called a maker of such a ford, a tirthankara. The Prakrit term niggantha (nirgrantha in Sanskrit), literally "free from bonds," was originally used to designate such a person and the ascetics of the tradition. Jainism as it has survived to this day is traced back to the life and teachings of the jina Mahavira (literally, the "Great Hero"), whose given name was Vardhamana. However, in the Jain tradition Mahavira is not the only jina and his position and significance has to be seen in the light of the Jain conception of time. Time is seen as a wheel which beginninglessly and endlessly rotates of its own accord. The wheel of time has twelve spokes which represent the different eras of time on a cosmological scale, each era being made up of thousands of years. The twelve eras are divided into two equal half-periods of the downward motion (apcsarpini) and the upward motion (utsarpini) of the wheel of time, with six eras in each. According to the tradition twenty-four jinas are born as human beings in each half period of cosmological time, in the third and fourth eras of each. In the present downward motion of the time-wheel Vrsabha was the first and Mahavira, who was a contemporary of Gautama Buddha, the last jina. Scholars ascribe undoubted historicity to Mahavira and his predecessor Parsva, the twenty-third jina, who lived about 250 years earlier. 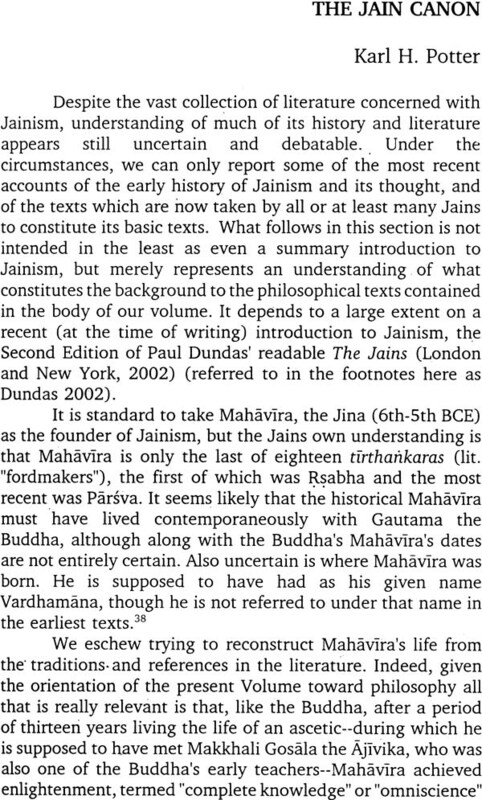 It is in this sense that Mahavira is not the founder of Jainism, but rather a reformer who based his life and teachings on those of his predecessor (e.g., adding one more "great vow" to Parsva's four for the ascetics). Unlike the Buddhist view that the Buddha set in motion the law of beings and things with his first sermon as recorded in the famous Dharmacakrapravartanasutra, the Jains believe that the law of beings and things is eternal and has always been so, with Mahavira resuscitating the basic doctrines of the tradition. A moot question is: In what sense can persons like Mahavira (or the Buddha or the Upanisadic thinkers) be regarded as philosophers? 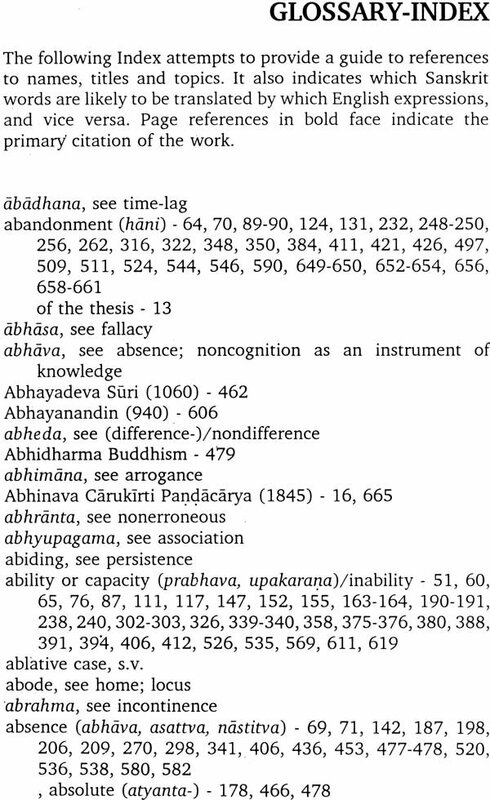 Nothing of what Mahavira taught (as with the Buddha too) is available in his original words, his life and teachings being redacted finally by others into a canon several centuries after his death. Even Mahavira's dates are a matter of debate, although there is clear evidence that Mahavira was the Buddha's contemporary, sometime between the sixth and fourth centuries B.C.E. Mahavira can be regarded as a philosopher in the sense that his life, teachings, ideas and concepts moulded the philosophical activity of the thinkers in the tradition since then. Mahavira serves as a model not only for achieving the goal of enlightenment which he himself realized, the goal of nirvana or moksa which is common to Buddhism and Hinduism as well, but also as a model for insightful thinking about human nature, life and the world. 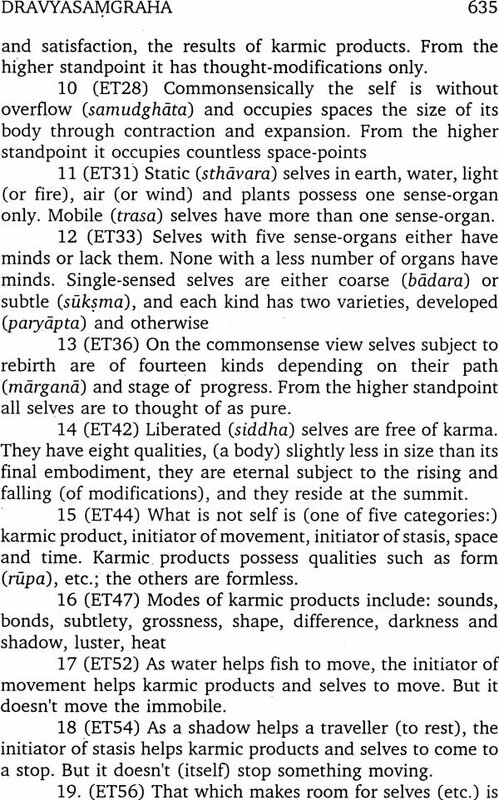 Everything that comes under the rubric of Jainism encompasses a vast area, because through the influence of. Mahavira and his teachings the Jains have made major contributions in all fields of learning ranging from philosophy to literature, from rules governing religious thought and practice to temple architecture. Jainism is an indigenous, inalienable and well represented part of Indian thought, of Indian art and literature, in short of Indian culture. 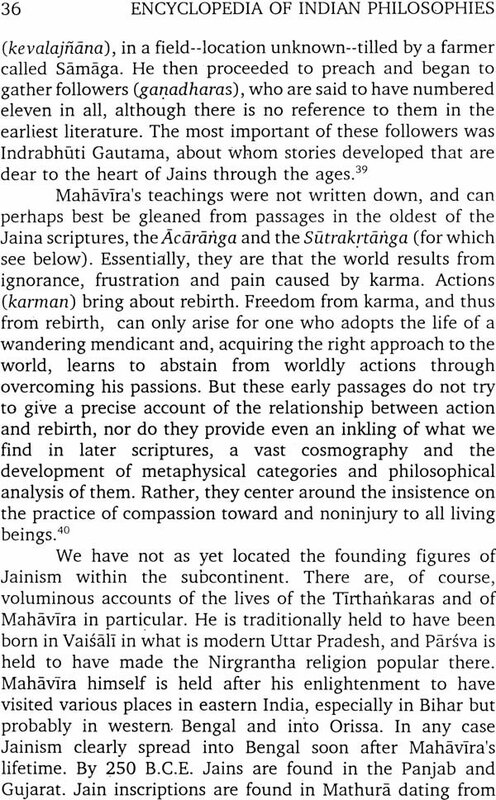 This point is significant to note because, especially as far as the contribution of Jain philosophy is concerned, independent studies of specific themes are relatively few concerned to what has been done in Hinduism and Buddhism. Whereas it is impossible to deal with Jain philosophy in a vacuum and to fully comprehend its significance without recourse to corresponding developments in Buddhism and. Hinduism, the reverse is no less true. 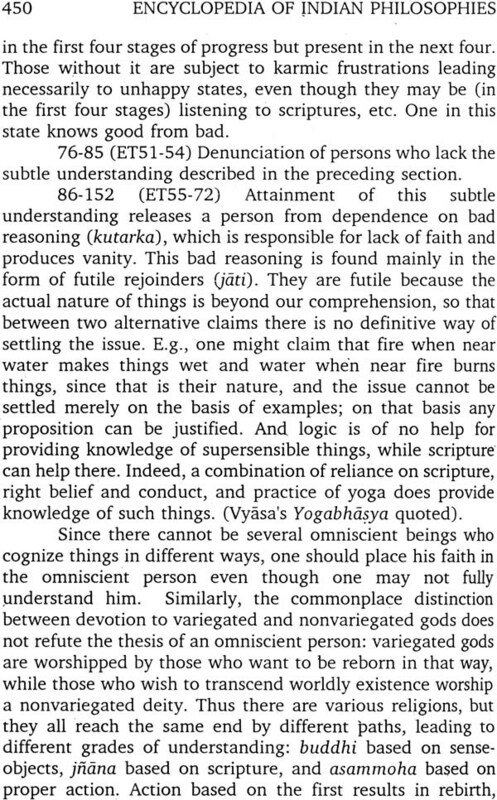 Several intricate philosophical problems remain obscure without an adequate understanding of Jain philosophy, e.g., the innumerable references to anekantavada, the famous doctrine of manifoldness, which is a small, albeit basic, part of Jain thought. 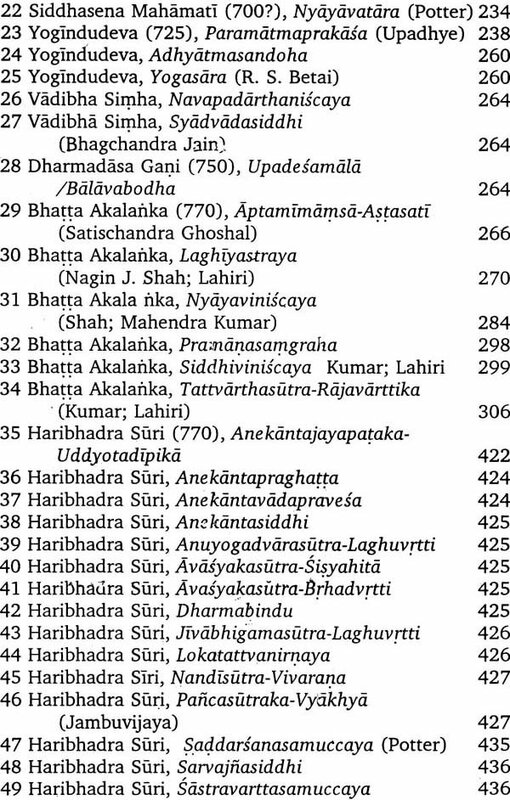 One is led to ignore the fact that Jain philosophy has made other contributions apart from the syad- and naya-vada aspects of anekantavada, e.g., insightful deliberations concerning dravya, guna and paryaya (substance, quality and mode). This volume on Jainism will make it evident that throughout its history Jain thinkers have kept pace with equal developments in Buddhism and Hinduism. Implicitly or explicitly, Jain thinkers trace back the inspiration for the source of their philosophical ideas ultimately to the essence of Mahavira's teachings, and the earliest sources for Mahavira’s ideas are the canonical works of the tradition, from which the thinkers drew. 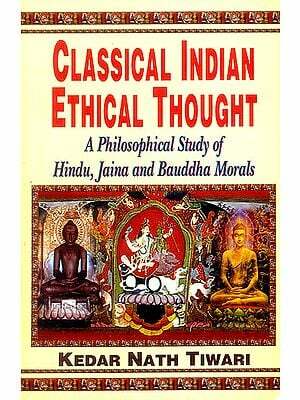 This is not the place to discuss the complex issue of the Jain canon. Suffice it to say that both the major groups of Jains, the Digambaras and the Svetambaras have groups of texts which they regarded as sacred because they contain Mahavira's basic teachings. These canonical works make laborious reading especially because of their repetitive nature (obviously based on an oral tradition); whatever is philosophically relevant in them has to be extracted out of a huge volume of material on a: wide range of topics, such as the conduct of the monks and nuns and general rules for ascetics. 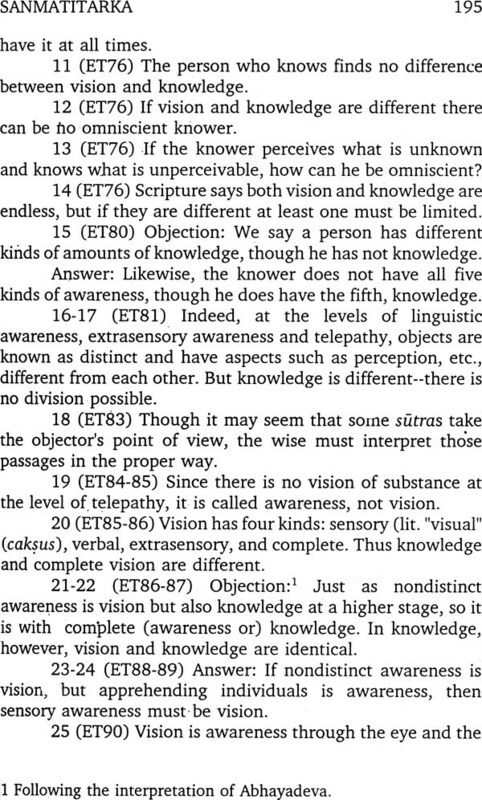 In other words, Mahavira's teachings are scattered over the canon in an unsystematic manner. 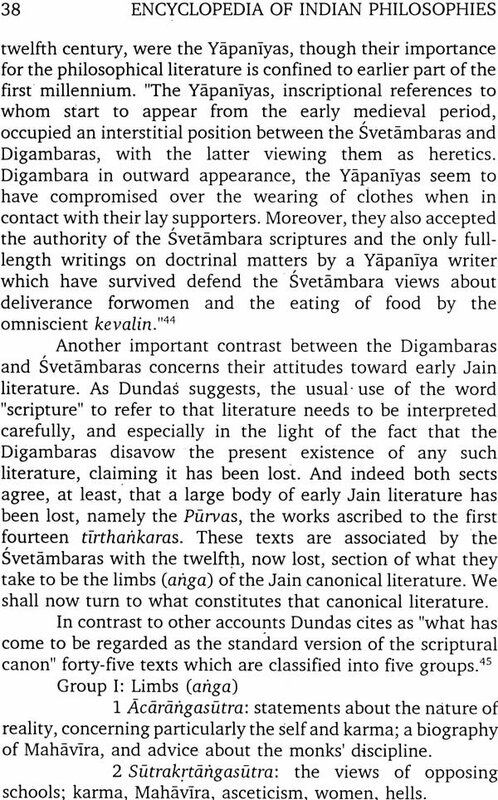 Whereas a systematic study of the philosophical elements in the works of the Jain canon is undoubtedly a fruitful undertaking, such a study will be a restricted endeavor insofar as one will be hard-pressed to link it to later philosophical activity. A case in point is anekantavada. This famous doctrine of manifoldness, often erroneously taken as a synonym for Jain philosophy as a whole, is based on Mahavira's method of seeing the truths concerning all objects of inquiry from particular standpoints or perspectives. 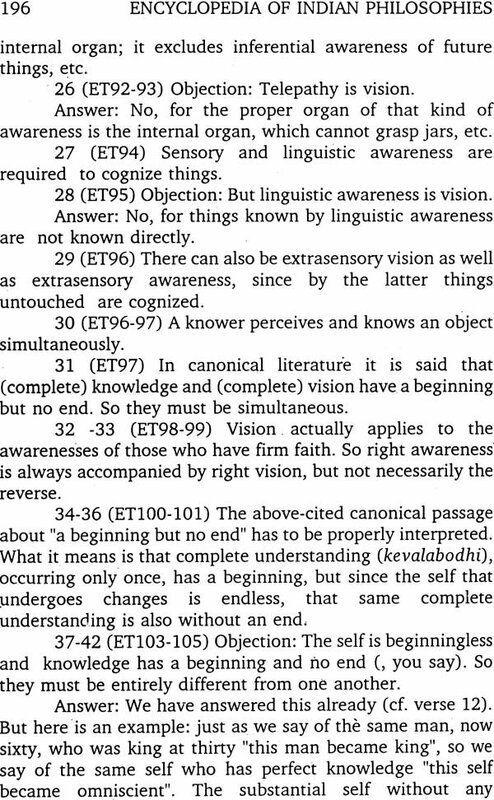 Later thinkers developed this basic idea into an elaborated systematic theory in such a way that the link to the canonical works either becomes lost or is blurred. 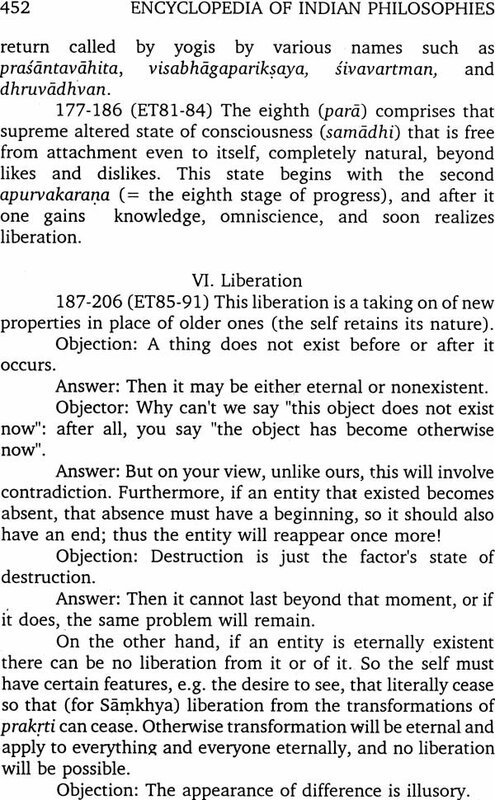 The case is similar to taking the works of Badarayana for Vedanta or Jaimini for Mimamsa as a source, instead of directly dealing with the Vedic texts for the development of the philosophy in the respective traditions. The question then is: are there comparable works in the Jaina tradition? 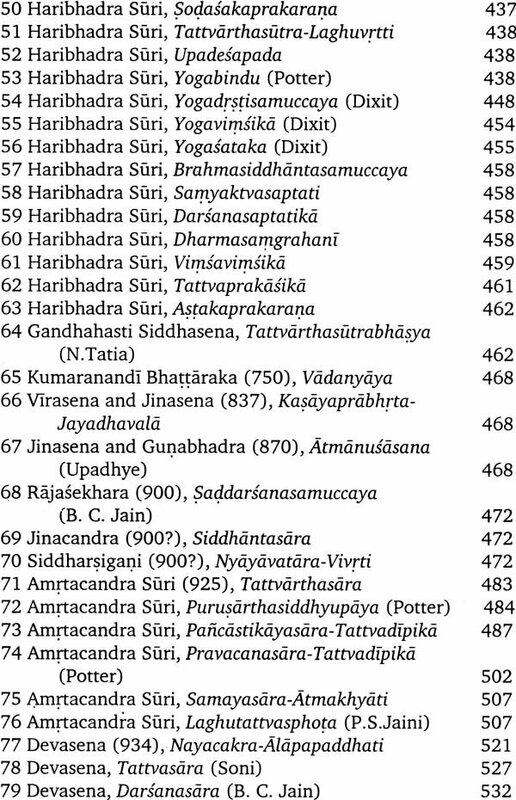 The first attempt to present Jain philosophy in the form of the classical Sanskrit sutras of the other schools of Indian philosophy was done by Umasvati (also called Umasvami) in his so-called pro-canonical work Tattvarthastra (also called Tattvarthadhigamasutra). 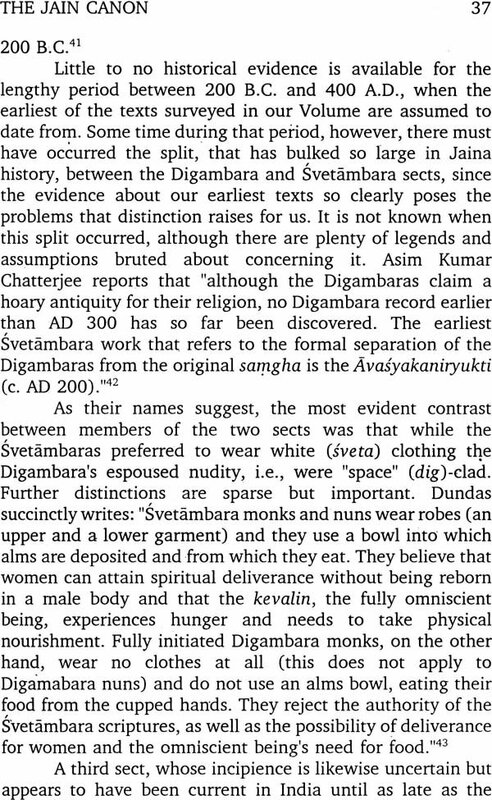 Indeed, there have been early successful attempts to deal with Jain philosophy in a similar manner in the Prakrit language as well, for example, by Kundakunda and Siddhasena Divakara. There is no conclusive dating of these pioneer thinkers in the Jain tradition, the last of whom belonged to the fifth or sixth century CE. 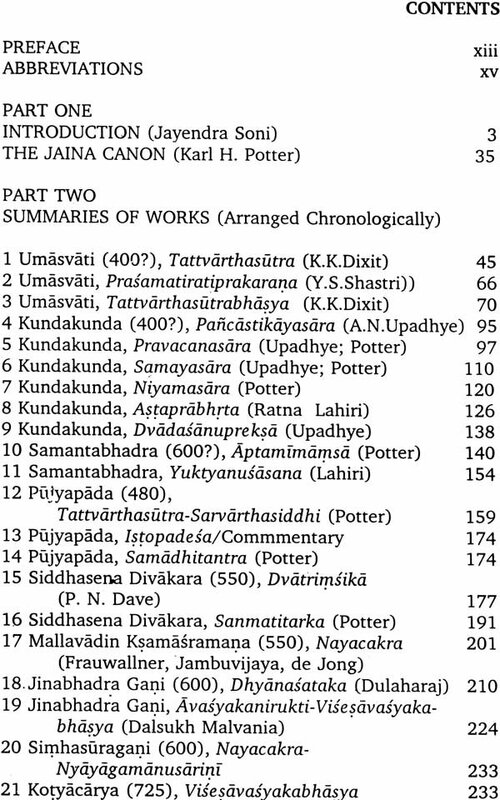 Summaries of their works are dealt with below in this volume; hence it is not necessary here to deal with Jain ontology arid metaphysics in detail in this Introduction. Rather, an attempt is being made here, with reference to Umasvati and Kundakunda, to deal with a basic problem related to these aspects of philosophy, namely, with the terms tattva and padartha which are used for both the basic ontological and the metaphysical categories. The first question is whether there are seven (Umasvati) or nine (Kundakunda) such categories.